Kids love trick-or-treating for Halloween candy. 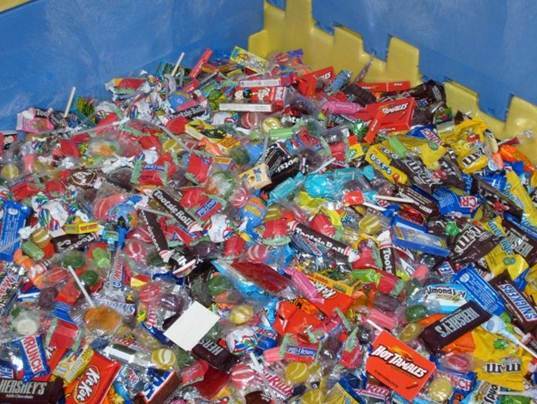 However, by the middle of November, most kids have tired of their overwhelming stash, leaving candy to go bad. Plus, while a treat now and then is good, the excessive amounts of candy given out on Halloween isn’t really all that healthy for your child. What can you do? Locate a Halloween Candy Buy-Back Program! A Halloween Candy Buy-Back Program is when a dentist buys back your kid’s candy treats in exchange for coupons, toothbrushes, creative exchanges and yes, sometimes even cold hard cash. After the candy has been collected, the dentists send the candy to Operation Gratitude or other Military support groups. Last year this helpful program received and shipped 125 TONS of candy out to troops. If you’re a parent, and the thought of all those treats is making you queasy already, then locate a participating dentist at the Halloween Candy Buy-Back Program website. If you’re a dentist who would like to participate, the Halloween Candy Buy-Back Program can get you set up with fliers, photos and other helpful tips. Plus, as a dentist, this is great publicity. Dentists can register here. This really is a nice program. Parents are happy because their kids aren’t gorging on treats. Kids are happy because they get to have fun selling their goodies for stuff they might enjoy more, and plenty of troops are happy because they receive some sweet care packages. Win-win-win! Kids love trick-or-treating for Halloween candy. However, by the middle of�November, most kids have tired of their�overwhelming�stash, leaving candy to go bad. Plus, while a treat now and then is good, the excessive amounts of candy given out on Halloween isn't really all that healthy for your child. What can you do? Locate a Halloween Candy Buy-Back Program! A Halloween Candy Buy-Back Program is when a dentist buys back your kid's candy treats in exchange for coupons, toothbrushes, creative exchanges and yes, sometimes even cold hard cash. After the candy has been collected, the dentists send the candy to Operation Gratitude or other Military support groups. Last year this helpful program received and shipped 125 TONS of candy out to troops.